Stacey Epstein: I’m the CEO of Zinc, a secure enterprise communication platform that connects deskless teams with their peers and desktop counterparts. Zinc supports any mode of conversation natively on iOS, Android, Mac, Windows, and Chrome. Features include 1:1 and group messaging, voice and video calling, live streaming push-to-talk, content and location sharing. Broadcasts deliver 1:many urgent alerts or safety messages. Conversation Analytics deliver unparalleled insights to customers, and a public messaging API allows for Contextual Conversations. Zinc also offers unique features like Official and Hotline Groups, which allow mobile workers to connect directly with their experts in call or help centers, and/or to message into different expert managed queues like troubleshooting, product experts, HR, or other support groups. Stacey Epstein: The distinct advantage of Zinc’s all mode communication platform is its award winning and highly intuitive mobile experience. You might be surprised to know that 80% of the workforce is deskless. Field service technicians, utility crews, factory workers, delivery drivers, construction workers, hospitality staff, store clerks, home healthcare providers — deskless workers are all around us and have been for ages. But while office-based desktop workers have seen rapid advancements in technology, with new tools to make their jobs easier cropping up every day, the same isn’t true for deskless workers. Desk workers have a multitude of business chat apps and collaboration tools to choose from. But deskless workers are resistant to tools that don’t address their specific needs. Despite technology innovation, most business instant messaging apps apply to limited use-cases or are too complex for the fast-paced needs of frontline workers. Employee frustration leads to lack of adoption, poor communication, or in many cases, the use of non-compliant consumer apps that lack the necessary security and administrative capabilities. The result – Organizations suffer from disconnected employees and decreased efficiency. The Zinc UX was purpose-built specifically for this “always-mobile” worker, driving not only adoption but also enabling fast and easy enterprise-wide deployment. Stacey Epstein: Telecommunications/Cable, Utilities, Manufacturing, Construction, Hospitality. Really any industry with a decent % of deskless workers. Stacey Epstein: Zinc addresses some of the most important challenges field-based teams face. For companies like DISH Networks, or Vivint Smarthome, “time-to-service” is everything. As a consumer, when you want your satellite TV, you want it now. When that technician shows up at the door, he faces a zillion different potential issues, as every home, every roof, every wiring set-up is different. If he doesn’t have the knowledge to fix the issue, and can’t get the help from a peer or expert in real-time, no one wins. If instead, he can perform a quick video call and solve the issue, all the major metrics are impacted. Not only time-to-service, but first-time fix rate, customer satisfaction/NPS, and even employee engagement and retention. 90% of survey respondents indicated that real-time communication is either mission-critical (50%) or very important (40%) to their field workers being able to do their jobs effectively. 70% of field service organizations surveyed say their visibility into field operations could use improvement. 23% of respondents are using consumer messaging apps – i.e. text, WhatsApp, GroupMe, etc. – which pose risks with security and administration. More than half of survey respondents (53%) reported that their field workers are only somewhat engaged or even somewhat disengaged. Further, 50% of respondents said that they need to improve upon their methods of enabling field workers to provide feedback to management. The findings from the report reinforce what we already know. Real-time communication drives measurable results for field teams, yet deskless workers aren’t armed with easy to use technology built with their unique needs in mind. Innovative field service organizations who embrace a communication platform built for deskless workers will improve the productivity of their workforce by giving them real-time access to the information and resources they need to get their jobs done. At Zinc, we pride ourselves in providing a frictionless way for field workers to get the knowledge they need in real time. Stacey Epstein: Vivint Smart Home is a leading smart home services provider based in Utah that is solving the communication conundrum for thousands of field technicians. Zinc worked with Vivint by rolling out a secure mobile communication platform that has made it easier to relay important information, improve messaging visibility, and provide valuable efficiency and customer service benefits. According to Vivint’s Brett Barboka, the Zinc platform has contributed to a 50 percent improvement in Vivint employee engagement and a 37 percent reduction in time to service. Additionally, Barboka goes on to say that the Zinc platform offered a number of features that Vivint Smart Home believed would improve its operations. For example, employees can be easily organized into groups or teams using the tool. Urgent or important messages can be separated from day-to-day conversations. The field service team would also have access to functionality that would help them to collaborate more easily. 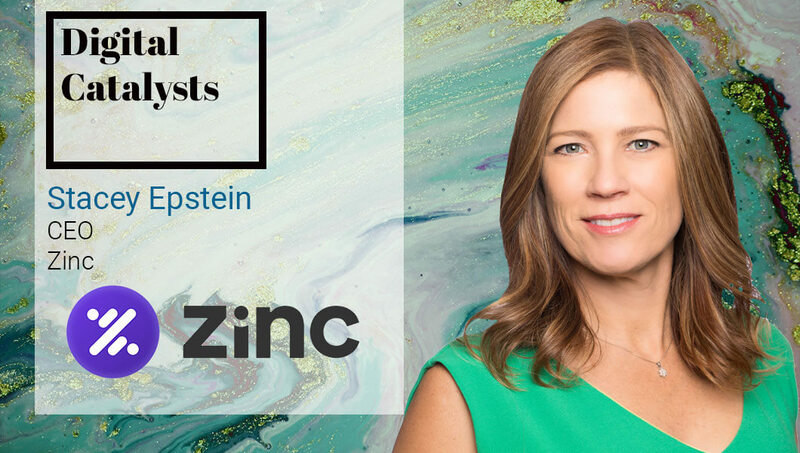 Stacey Epstein: Zinc’s Hotline Groups is a simple yet efficient way to get instant answers from a group of experts within the company so field teams can complete jobs faster. Hotline Groups was developed in response to a widespread issue among field workers in various industries, Hotline Groups allows teams to bypass the long hold times and email queues that waste valuable time and often lead to return visits, and instead get an immediate and direct line of communication to colleagues who have the right knowledge. Stacey Epstein: Every morning on my commute, I read the top business news on my phone, all of the Fortune newsletters, The Skimm, and I look through Twitter and LinkedIn. On the way home I read the NY Times roundup. Don’t worry, I don’t drive, I take BART! Stacey Epstein: I wish I had more time to read! Someone just recommended High Growth Handbook to me, so that’s next on my list.